With this MQ2 project, Seattle-based producer Jenny Asarnow explored new ways of bringing a documentary to its subject by inviting random individuals from a particular Seattle neighborhood to generate their own “documentation” using cell phones while engaging with a public installation designed to attract passersby. The focus of Asarnow’s work is a crossroads in the Central District in Seattle, Washington, a historically black neighborhood that is going through gentrification. The project was designed to be a model for using traditional reporting, installation, and community response to document social tensions and other reflections of the everyday life of a community in transition. The documentation of the neighborhood was spread broadly online via public media broadcast stations and online streaming radio. Jenny worked with photographer Inye Wokoma, graffiti/installation artists NKO and “Scratchmaster” Joe Martinez, Web designer/artist Anna Callahan and software engineer Joseph Sheedy. Read “The Making of The Corner,” a special feature on Transom.org. By combining traditional and new media tools, including public radio broadcasts, sound-mapping, and social networking, New Orleans producer Jacob Brancasi and his project partner, Heather Booth, provide a platform for the citizens of the city to share compelling audio and online content that vividly reflects the culture and people of New Orleans. By engaging and providing training to everyday citizens of the city as the project’s principal storytellers, Open Sound offered unique authenticity. Brancasi and Booth tapped into established networks of community organizations, neighborhood groups, and willing individuals to commission diverse, direct dispatches from across the city. Each contributor’s stories were automatically added to a soundmap of the city, archived and geotagged. Sounds and stories were broadcast via local radio outlet WWNO and made available for national distribution, which engaged millions of listeners across the U.S. via NPR, including those affected by the Katrina diaspora. Audio pieces contributed to the website fall under a Creative Commons Attribution-Noncommercial-Share Alike 3.0 license, allowing the sound on the site to be distributed virally — copied, distributed, transmitted, and adapted by any visitor to the site. Jacob and Heather gave NPR’s Liane Hansen a tour of their project on NPR’s Weekend Edition. Listen here. Los Angeles producer Anyi Howell’s Pluglife harnessed an existing, vibrant online community of Los Angeles-area youth aged 18 to 24, assigning them to be public media “plugs” reporting on hyperlocal politics (i.e., town council meetings) as a means of generating greater engagement and fresh awareness of how the action (or inaction) of local government affects a community ecosystem. Their focused representation of events and trends in their own communities were spread via traditional platforms — local and national broadcasts — and social networks. The plugs were, through their work, converged online at pluglife.org. There, when presented together, they represented a broad network of subcommunities and painted a more nuanced picture of the Los Angeles metro area. Anita Johnson’s Beyond the Odds tapped into an online community of individuals aged 18 to 24 to call attention to an increased spread of the HIV/AIDS infection among low-income and minority youth. The project, based in Berkeley, CA, generated a repository of timely and relevant material and had as an editorial focus the intersection between HIV/AIDS and factors of race and economic status. The online blog of the project offered audio features and engaging public service announcement videos, which drive discussion among their growing on-line community. The principal bloggers were those who are most affected by HIV—young people who are HIV positive. They shared their experiences, and collaborated with young poets to create video poems that tell their stories. By extending the project throughout their own online groups, they were able to amplify the reach and impact of the project. To read a Beyond the Odds blog that was re-purposed by the Huffington Post click here. CyberFrequencies is a multimedia project exploring how the Web and technology are transforming our culture daily. Kim created the project with Los Angeles-based videographer Tanya Jo Miller. The centerpiece is a fast-paced news and culture podcast that’s sourced completely from the Web. The podcast excerpted audio, video, and blog content that was published by outside sources. Though CyberFrequencies centers around a podcast, the website served as a continuum of the podcast where audiences went to post comments and see related videos, blogs, and links to stories. Audio features broadcasted on KPCC, and online material was incubated on NPR’s website. The project challenges public radio’s focus on proprietary content, arguing if public radio doesn’t exploit the viral world it risks being left behind the new media landscape. To read the CyberFrequencies guest blog on NPR’s Soap Box Weekend Edition click here. Mapping Main Street connected online, socially engaged communities of non-public radio and public radio listeners to tell stories about Main Streets across the U.S. The project intended to challenge people’s definitions of Main Street and to reflect this deeply transitional time in our country by visiting the street that carries great symbolic meaning. Kara Oehler works out of Boston and in collaboration with New York-based producer Ann Heppermann. Together, they create a series of four short audio stories profiling different Main Streets in geographically-diverse areas in the U.S. In addition to on-air broadcast on NPR, Oehler drove listeners and contributors to stories posted on an interactive website that included related multimedia content like video slideshows, user-generated visual and text content (“UGC”), as well as user/audience feedback. Oehler worked with musicians to create soundtracks to the stories. Additional financial support and consultation on this project came from Harvard’s Berkman Center for Internet and Society. To check out Mapping Main Street’s NPR Weekend Soapbox blog click here. Click through links to listen to NPR stories about Main Streets in Chattanooga, Tennessee, San Luis, Arizona, and Lewistown, Montana. 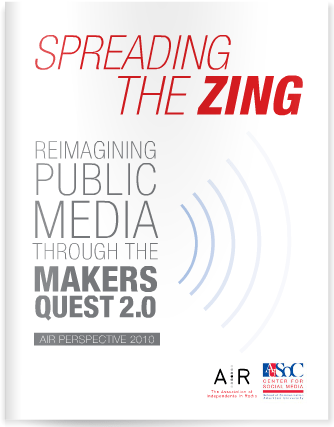 In 2010, the technology team behind Mapping Main Street launched Zeega, a next-generation participatory platform project, and were awarded a 2011 Knight News Challenge grant to continue developing the work. Lu Olkowski’s MQ2 project partnered radio producers with poets and photographers as co-reporters on news about the working poor during the current economic crisis. Her nationally distributed radio features and related audio slideshows, consisting of poems and photography, profiled the working poor of two communities in the United States. Her audio features were made available on PRI’s Studio 360 (distributed to 150 public radio stations nationwide), on the Virginia Quarterly Review’s website, and distributed via an iPhone application* (available online through the iTunes Store). All poems were published in the print edition of Virginia Quarterly Review and on VQR’s website. The evolution of the project was blogged about and stories were spread virally via social networking sites. Read “In Verse: The Making of Women of Troy,” a special feature on Transom.org. Shea Shackelford used multivoice storytelling to create a national, online multimedia map of places we love that no longer exist, except in first-person recollections. Shackelford and his project partner Jennifer Deer have cultivated two groups of contributors — Internet users who are active participants on social networking sites and radio listeners who are looking for a way to react to and contribute to the stories they have heard. Online participants populated an interactive map, tagging their own remembered places and uploading their own writing, images, video and audio. This created a visual network of collective user-generated memories. The accompanying radio features, which are archived online, were broadcast to millions of listeners via NPR and are available to radio stations on PRX. Contributors further disseminated stories through their own friend/peer/professional colleague networks. Listen to Shea’s NPR story about San Antonio’s Taco Land. To hear the NPR radio feature called “Rabbit So Good, A Restaurant Remembered” click here.